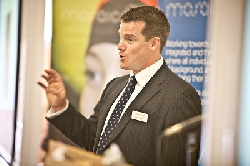 It is with much pleasure that Mosaic is able to announce that Jonathan Freeman, currently on secondment from the Department for Communities and Local Government as National Operations Director has been selected for the new role of National Director Mosaic UK, as previously advertised. Jonathan’s selection not only reflects the enormous effort he has made over the last two and a half years to develop the operations of Mosaic in the UK, but also his enthusiasm and vision for Mosaic in the future and we wish him well in this new role. John O’Brien, Managing Director of Mosaic said “I am delighted that Jonathan chose to apply for this important post and know that the National Advisory Board were unanimous in selecting him as the best candidate to take Mosaic forward. I have no doubt that his appointment will be welcomed by all those around the country who have had the pleasure of working with him to date and wish him all success in the new role”. Jonathan will assume the new role with effect from 1st January.